LinkedIn helps job-seekers navigate successful paths to their dream jobs through exploration tools and mentorship. A big challenge facing job seekers is knowing what types of jobs to search for — or even which ones exist. Enter LinkedIn’s new career exploration pages. Browse different careers within job functions (e.g. accounting jobs or education jobs), and from there research top cities, companies and see what opportunities are available. Looking for engineering jobs? 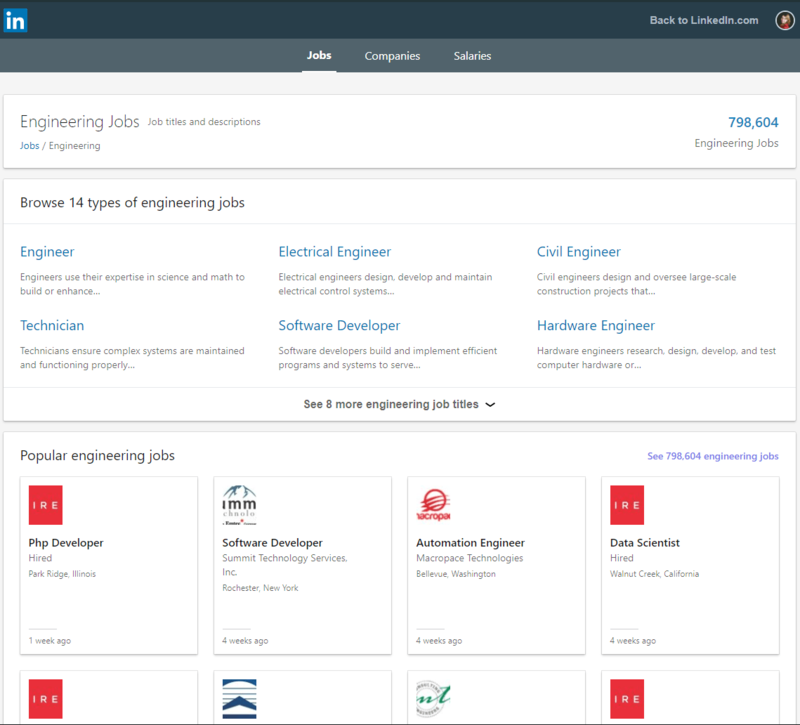 LinkedIn surfaces popular job titles and listings as well as top cities and companies within job functions. There are twenty-five job functions waiting for you to explore, making it easy to research the industry you want to break into. Plus, you can simply toggle to Jobs, Companies, and Salaries, so you can be fully equipped to figure out your next steps. 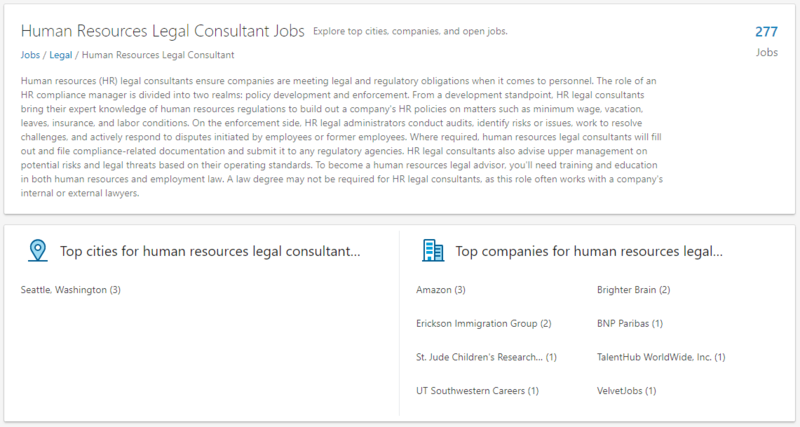 Narrow your search for legal jobs to a specific title and research available opportunities. But finding the perfect job is just one part of the equation. Breaking into an industry can be intimidating, especially if you aren’t quite sure where to begin. One of the best ways to start creating your roadmap to success is learning from those who have been already been in your shoes. Mentorship is key to developing and sustaining a satisfying career and improving your professional life. However, knowing where to start is the tricky part. That’s why LinkedIn launched Career Advice, a new feature connecting members across the LinkedIn network with one another for lightweight mentorship opportunities. Whether you need advice on your career path, best practices for a project you’re working on, or even switching to a new industry, Career Advice can help you find and connect with the right person. More than 80% of professionals on LinkedIn have stated they either want to have a mentor or be one to others. Over 50% of those surveyed don’t know where to begin, and more than one-third have a hard time finding the right mentor. With more than 530 million professionals in the LinkedIn community, there is no other place where you can access such a wide range of knowledge, skills, and resources to help you reach your goals. Getting started is easy! Just go to the dashboard on your LinkedIn Profile and find the Career Advice hub. From there, enter your preferences for the type of advice you’re looking to receive, and LinkedIn’s matching algorithm will recommend members based on your network connection preferences, mutual interests, and your specified industry. You’ll be alerted whenever you are matched so you can send a message and start the conversation. Bonus tip: Rock your resume with Resume Assistant from Microsoft and LinkedIn to help you craft a compelling resume directly within Word. Finding (and landing) your dream job has never been easier! The Laurus College Career Services Department is available to help students set up their LinkedIn profiles and take advantage of the features discussed in this article.